Saturday was the Fourth Annual Worldwide Photo Walk. I took part in the Quincy photo walk and had a great time. These are some of my pictures, you can see more of the group's photos on Flickr. All are great! But I must admit my favorites are the two of statues. It must be fun to take part of such walks! What a great idea Photo Walk is! Love your photos - the fragile and sweet flowers juxtaposed with the statues are superb. nicely done, particularly on such a gray, grim day...at least it was here. Fabulous photos, love the way you've put it together, nice mix! Pretty good idea this photo walk event, would be interesting to do. I'm in love by the orange flower with the little critter!Amazing mosaic! 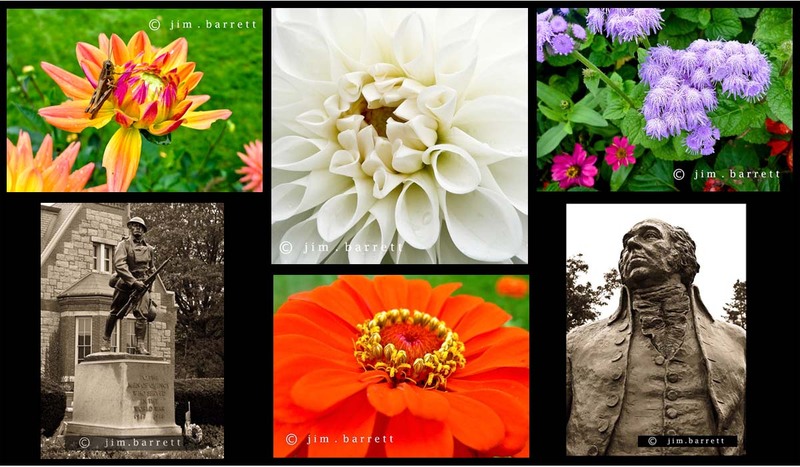 Great photos of flowers and landmarks! I did a Photo Walk on Saturday with a model - come see our Photo Walk on my EAGAN daily photo blog today! Beautifully arranged collage with the sculptures "holding down" the arrangement. Flowers are all loveslyh, especiall the white blossom. Thanks for the Flickr link also; quite a variety of subjects. A nice collection, especially the statues. I was going to ask how one could have a Quincy walk without an Adams, but on Flickr I see that Adams is represented. Very nice photos! I'm glad the walk went well. Sage was very happy to be organizing the Quincy walk!